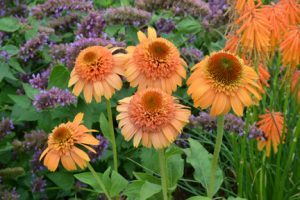 If you have never grown Echinacea purpurea (aka coneflower), this is the year to do so. If you have grown this native prairie plant, there are new varieties and colors for your garden. ‘Supreme Cantaloupe’ has double flowers the color of the fruit. ‘Rocket Man’ sports long single petals in the hue of watermelon. Echinacea is a reliable low-maintenance performer in a wide variety of conditions, though it does best in a sunny, well-drained spot.